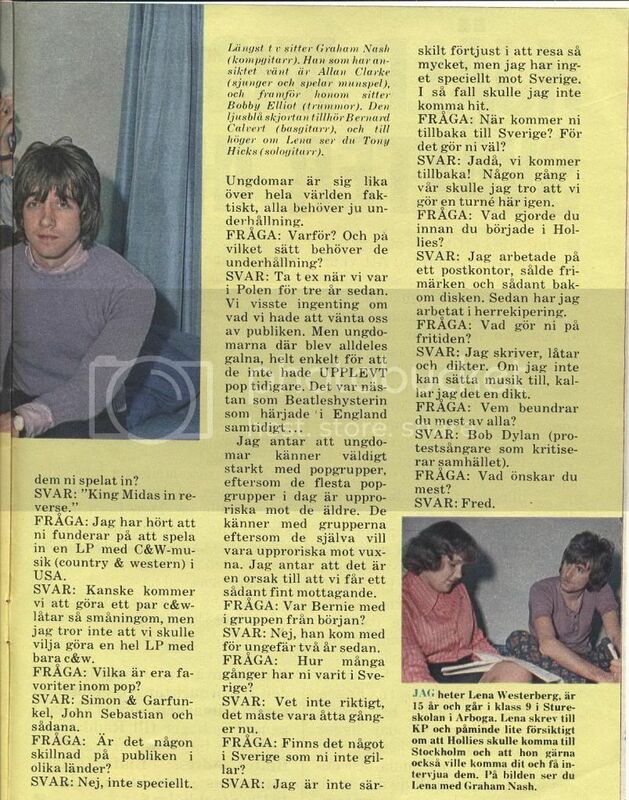 An interview with Graham Nash, made by a Swedish Hollies fan, that I found in a childrens magazine from 1968. 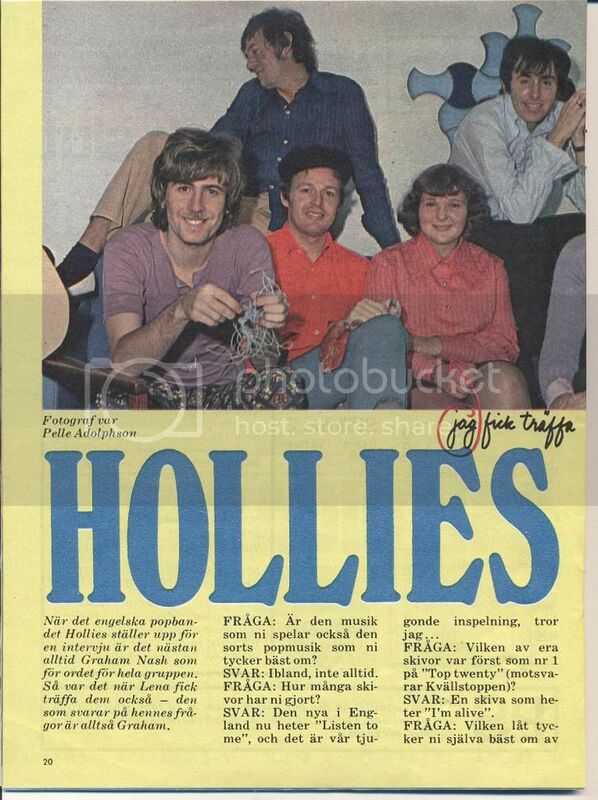 Swedish Holliesfan Lena Westerberg, age 15, got to meet and interview the Hollies on their tour of Sweden 1968. When the English pop group the Hollies give an interview, it’s almost always Graham Nash who speaks for the whole group. That was the case when Lena met them too – the one who answers her questions is Graham. Question: Is the music that you play also the music that you like the most? Question: How many records have you recorded? Answer: The new one in England is called “Listen To Me” and it is our 20th recording, I think. Question: Witch one of your records was the first one to get to nr 1 in the Top Twenty? Answer: A record called “I’m Alive”. Question: Which song do you like best of all the songs you’ve recorded? Answer: “King Midas In Reverse”. Question: I have heard that you are thinking of recording an LP with C&W music in America. Answer: Perhaps we will record a couple of c&w songs eventually, but I don’t think we will record an LP with just c&w. Question: Who are your favourites in pop music? Answer: Simon & Garfunkel, John Sebastian and others. Question: Is there any difference between audiences in different countries? Answer: No, not in particular. Young people are the same all over the world, everyone needs entertainment. Question: Why? And in which way do they need entertainment? Answer: For example when we were in Poland three years ago. We didn’t know anything about what we could expect from the audience. But the kids there just went wild, just because they hadn’t EXPERIENCED pop before. It was almost like the Beatlesmania that was ravaging in England at the same time. I suppose that young people feel very strongly about pop groups, since most of the groups today are rebellious against grown ups. I guess that’s a reason why we get such a good reception. Question: Was Bernie with the group from the start? Answer: No, he joined us about two years ago. Question: How many times have you been in Sweden? Answer: I’m not sure, it must be eight times now. Question: Is there anything in Sweden that you don’t like? Answer: I’m not very fond of travelling really, but I have nothing against Sweden. If I had, I wouldn’t come here. Question: When are you coming back to Sweden? Because you are coming back, aren’t you? Answer: Oh yes, we will be back! Sometime next spring I think we will tour here again. Question: What were you doing before you joined the Hollies? Answer: I was working in a post office, selling stamps and things behind a counter. Then I have worked in a shop selling men’s clothes. Question: What do you do in your spare time? Answer: I write, songs and poems. If I can’t put music to something I’ve written, I call it a poem. Question: Who do your admire most of all? Answer: Bob Dylan (protest singer who is criticizing the society). Question: What do you wish for most of all? Very well done, Agneta! Interesting to read those old clips. It all adds to the story of the band.